After years of studying late into the night, cramming for tests and working hard, it’s time to reward your favorite graduate with a really great gift. Here are a few ideas everyone on your list will love. What do many new graduates do right after getting their diploma? They pack up and move away to a new job or college. Roku 3 allows them to take 750 channels of movies, television shows, sports, music and games with them. So, no more calling the cable company each time they move. Available at RadioShack, the device easily connects to a television and wireless network, then combines all of their streaming services in one place. Roku 3 makes it easy to find movies and shows quickly and the private listening mode is perfect for late-night streamers who don’t want to wake up roommates. They can also watch or play on a smartphone, iPad or other device no matter where they are. Visit www.RadioShack.com for more details. The Keurig MINI Plus Brewing System brews a perfect cup of coffee, tea, hot cocoa or iced beverage in under two minutes at the touch of a button. With the choice of three cup sizes, the MINI Plus brewer offers a removable drip tray to accommodate short travel mugs. To operate, you simply add fresh water into the single-use reservoir, choose your favorite K-Cup pack, brew and enjoy. 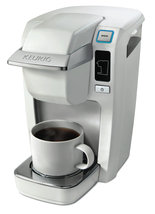 Find out more at www.keurig.com. Get a gift that allows your graduate to charge up to four electronic devices at once. The Belkin Conserve Valet features a sleek design that keeps cords neat and organized. Most chargers continue to use power as long as they’re plugged into the wall — even after you unplug your device. The Conserve Valet Smart USB Charging Station lets you charge all of your mobile devices in one convenient place, and automatically shuts off power — including standby power — after devices are fully charged. It even senses when new devices are added so you always get a full charge, and has an innovative cord management system to keep things neat. Keep your devices ready to go, and save energy, too. For more information, see www.belkin.com.